After my last post about how to use the portion control color coded containers, I thought I’d explain exactly how I am using them and give you some examples of the 21 day fix meal plan that I use and follow each day. There are many different recipes and snack ideas that I have accumulated to make the diet easy to follow and actually enjoyable. Let’s discuss an example of what I will eat in one day while using this exercise program. First of all, I’m using the 1200-1499 calorie bracket. I try to be as strict as possible throughout the day but I do make some exceptions. I pretty much never measure the vegetable containers and have as many vegetables as I want provided they are prepared without any extra oils/dressings. Vegetables are so low in calories that it hardly makes a difference and they can really help fill you up. For breakfast, I will choose to make either a smoothie, omelette, sorbet or oatmeal depending on my hunger level. 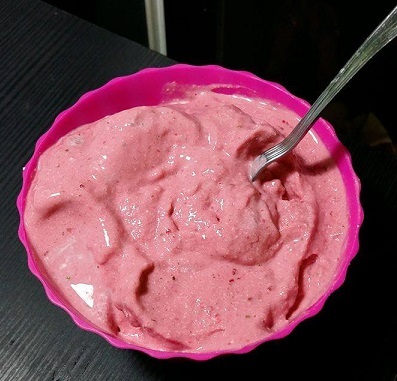 Now that it is summer and scorching hot out there, I’ve been loving making a protein rich strawberry sorbet using one red container and one purple container. Blend in a food processor until it creates a sorbet texture. Add stevia to make sweetener and a dash of cinnamon. You can add a splash of skim milk or more yogurt to make it creamier, or add more berries to make it thicker. In my photo on the right, I used strawberries and cottage cheese. It’s chalk full of protein and tastes absolutely delicious. My 21 day fix meal plan varies for lunch each day depending on my hunger level. If I’m really hungry or need extra energy for the day, I’ll have a yellow container in addition to my protein and vegetables. I often just have a vegetable and cheese omelette or a protein based vegetable salad. Chicken Tomato Balsamic salad with 1 or 1.5 red containers filled with sliced grilled chicken, 2 green containers (1 filled with cherry tomatoes, the other with romaine lettuce). I’ll add some green onion and then use one orange container filled with Italian Light or Balsamic Light vinagrette salad dressing and maybe one teaspoon of olive oil. I sometimes make protein energy balls for a snack which I’ll put the recipe up shortly. Or I will have a red container with greek yogurt mixed with a purple container filled with sliced strawberries or pineapple. Add a bit of stevia to the plain yogurt to help fill you up further! For dinner I always like to have two servings of protein, so two red containers, either of fish or chicken, and then a large plate of grilled or stir-fried vegetables. I’ll use one teaspoon of olive oil while frying the vegetables and if I have any carb containers left, I’ll have it with whole wheat pasta or rice. Shrimp, brown rice, soya sauce and red peppers/asparagus make a delicous dinner. Sometimes while on the 21 day fix meal plan, you’ll find yourself hungrier than you normally are. Maybe you’ve exercised more one day or done more daily activity, or perhaps your body is just adjusting to your new diet. But when this happens, there are several steps you can take to avoid sabotoging your diet. Have a tall glass of water or two and wait. If you’re still feeling hungry after this, you’ll need to have a snack. Add another container to your day or two. But not carbohydrates. Choose an extra fruit or protein, or perhaps both. Cottage cheese is an excellent choice as the proteins release slowly throughout the day after you eat it causing you to feel fuller longer. Have that with some berries and you’ll be good to go. Bring the 21 day fix containers filled with you with apple slices or almonds so you’ll still be able to track your diet while on the go. Stop for a coffee or tea with skim milk and sweetener to help give your stomach that feeling of “full”. Remember that variety is the key to succeeding on any diet. While the 21 day fix meal plan for one week might be great, you’ll get bored if you’re eating the same meals again and again. Mix up your eating plan and invent new recipes using the containers. Soon you’ll get used to what a good size portion is and be able to eat out in public with confidence that you are sticking to the 21 day fix eating plan.